George Bornemissza made a huge contribution to cafÃ© society in Canberra. Those of you who are old enough will remember when eating and drinking alfresco in Canberra in summer was made almost unbearable by bush flies. George’s work on dung beetles is why people in Canberra and many other areas can now enjoy their coffee in the sun without being driven mad by the flies. Dung breeding flies did not just have nuisance value. In northern Australia, the buffalo fly caused huge losses in the cattle industry and huge quantities of dung fouled pasture across the country. George Francis Bornemissza was born on 11 February 1924 in Baja, Hungary. His father Ferenc Bornemissza was an engineer. He began collecting and studying beetles in the forests around his hometown during his mid-teens and also dedicated much of his spare time to volunteering in museums and scientific institutions in Budapest. He studied science at the University of Budapest before obtaining his PhD in zoology at the University of Innsbruck, Austria in 1950. At the end of that year he fled central Europe to escape the post-World War II Soviet regimes and travelled to Western Australia arriving on the 31st December 1950. 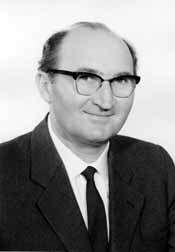 He worked with the Department of Zoology at the University of Western Australia for three years before joining CSIRO in 1955. George, originally from Hungary, noticed that most paddocks here were littered with dung pads and this wasn’t so in Hungary where cattle dung was rapidly buried by beetles. Australian native dung beetles obviously couldn’t cope with the huge quantities of wet dung. So George recommended bringing in bovine-dung specialists adapted to do the job. He hypothesised that the introduction of foreign dung beetle species that were able to roll and bury cattle dung pads would aid not only Australia’s soil fertility by recycling the dung nutrients back into the ground, but would also reduce the number of pestilent flies and parasitic worms which use the dung pads as a breeding ground. After joining CSIRO, he continued to advocate his plan to introduce foreign dung beetle species whilst he worked on a number of other projects and studies such as the control of ragwort in Australia with the cinnabar moth, Callimorpha jacobaeae; observations on the hunting and mating behaviour of two species of scorpion flies (Bittacidae: Mecoptera); descriptions of the first Projapygidae from Western Australia with some additional notes on the family and its allies; and an analysis of arthropod succession in carrion and the effect of its decomposition on the soil fauna. The Australian Dung Beetle Project finally secured funding from the Australian Meat Research Committee and commenced in 1965. In his twenty-eight years with the Division, George identified around 150 species of beetles with the potential to fill ecological niches in Australia where cattle dung was not being recycled by native beetles. Nine of these years he spent in Africa where dung beetles had no trouble coping with cattle (even elephant) dung. Because of his concern for the environment, he was always careful to look for species that did not compete with our native dung beetles. The introduction of exotic dung beetles and their subsequent establishment in Australia is now history, and a very successful one at that. However, it fell short in filling all the climatic areas with their vast variety of habitats. This last statement was made in a report by Penny Edwards in 2007, which summarised investigations made by Landcare Australia to evaluate the distribution and abundance of introduced species of dung beetle across Australia. The investigation found that 23 of the 43 species of dung beetle introduced by Bornemissza and his team were still established and thriving all over Australia, and it recommended that further research be carried out in order to fill the empty ecological niches with new species of introduced dung beetle. George Bornemissza’s work is credited with being the reason why Australians today can enjoy a terrace cafÃ© culture, since the success of the project in reducing the number of bush flies by 90% has meant that outside dining is no longer illegal, as it once was in the 1950s. The ‘Australian Salute’, a flick of the hand recognised by older generations of Australians as the only solution to rid oneself of flies at that time, is now a dwindling gesture. The Australian Dung Beetle Project is also said to have had an impact on soil, water and pasture health that is ‘undoubtedly worth many millions of dollars a year’. George retired in 1983 and now lives in Tasmania. Since his retirement, he has commenced, as an ongoing project, compiling a world-wide collection of ‘old longicorn’ beetles (Prioninae) to be donated to the Australian National Insect Collection in due course. He sees some parallels between dung beetles and prionids in that both groups are the principal recyclers in their respective ecosystems. It is mainly dung beetles (with nearly 5 000 species) in grasslands and pastures and prionids (with nearly 1 500 species) in rainforests and woodlands. Because rainforests are disappearing at an alarming rate, George wants a rich and diverse collection of these beneficial beetles to be well represented in ANIC. George continues his work on habitat protection through his display collections of beetles gathered world-wide as he believes that these collections highlight what we are losing by our relentless, global habitat destruction. He is also investigating soil-breeding primitive stag beetles in temperate forests. Many people in Canberra have seen the wonderful (both in content and arrangement) Bornemissza beetle collection held by ANIC which is always very popular at Open Days. Half of the collection (30 drawers) is currently on display at Melbourne Museum’s ‘Bugs Alive’ exhibition. The amazing thing is that George has made similar collections several times so that as many people as possible can enjoy the beauty and diversity of beetles.